The coastal plain of the Arctic National Wildlife Refuge on Alaska's North Slope, just opened to drilling by the Trump Administration, is becoming more important for polar bears, caribou and other species, a new federal report finds. The Arctic National Wildlife Refuge’s coastal plain, the area slated by the Trump administration for oil leasing, is an increasingly important site for polar bears and is now used by two herds of caribou. It’s also, at least for now, showing fewer signs of warming, such as shrub expansion and coastal erosion, than other parts of Alaska’s rapidly warming North Slope. Those are among the findings in a U.S. Geological Survey report synthesizing wildlife knowledge about the 1002 area of the refuge, the 1.5 million-acre area that was opened to oil leasing under the sweeping tax legislation passed by Congress in December. The report, issued in cooperation with the U.S. Fish and Wildlife Service, summarizes findings of studies conducted between 2002 and 2017. Those years saw dramatic changes in polar bear use of the coastal plain, while Arctic ice retreat has also been dramatic during that period, the report said. While only 5.8 percent of collared adult females in the Southern Beaufort Sea population spent time on land in the fall, that percentage rose to 20 by 2014. Polar bears were spending, on average, 31 more days per year on land, the studies found. While only about a third of maternal dens were on land in the late 1980s and early 1990s, 55.2 percent were on land from 2007 to 2013, studies found. Polar bears are also being drawn to the ANWR coastal area by the bowhead whale scraps left by hunters from the Inupiat village of Kaktovik, the report noted. The USGS report included a note of warning about increased human activity on the ANWR coastal plain. “Increased frequency of bears on land, coupled with expanding human activities, is expected to lead to greater human-polar bear interaction and conflict,” the report said. The Porcupine Caribou Herd, the herd most frequently associated with the refuge, uses the coastal plain for calving in most years, the report said. The herd in some years uses nearby coastal areas in Canada for calving, and the shifts appear to have been in response to late snow melt on the Alaska coastal plain. There is evidence that the Porcupine herd “needs a large region from which the best conditions for calving can be selected in a given year,” the report said. For its post-calving period, the Porcupine herd relies on the ANWR coastal plain, the report said. The herd expanded from 123,00 in 2001 to more than 218,000 in 2017. 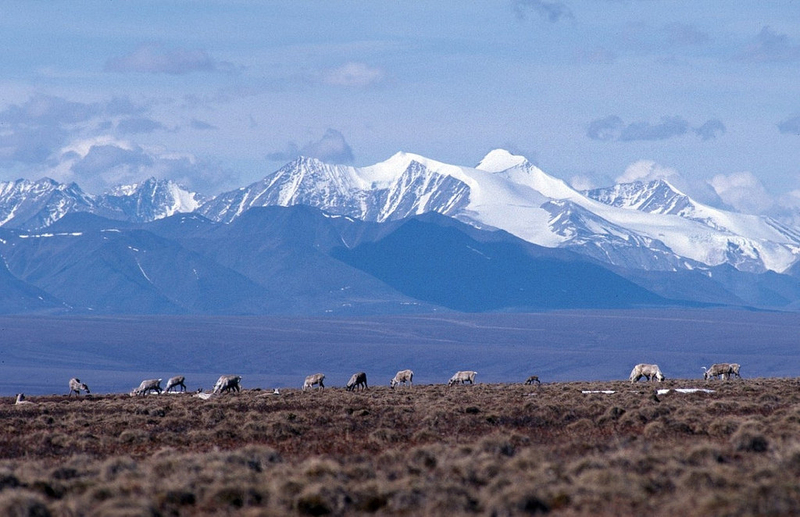 Another herd, the Central Arctic Caribou Herd, is also using the refuge’s coastal plain. Prior to 2001, that herd spent little time in the 1002 area, but its behavior has since shifted, the report said. The Central Arctic Caribou Herd, which numbered 70,000 in 2010 but was down to 20,000 animals in 2016, uses both the western and eastern sides of the North Slope, and has moved its calving activities away from more-developed areas with roads, pipelines and other infrastructure, the report said. Meanwhile, the quality of caribou forage plants remains high on the ANWR coastal plain, the report said. While shrub expansion over the tundra is common elsewhere in the Arctic, it was not a trend in the ANWR coastal plain in a study that monitored sites between 1984 and 2009, the report said. Shrub expansion benefits some wildlife species, but harms caribou. Coastal erosion, which “has become widespread and may be accelerating along the Arctic coast of Alaska, and is transforming some coastal habitats,” is affecting the ANWR 1002 area, the report said. However, erosion measured so far is not as dramatic as in other parts of the North Slope, the report said. Certain parts of the ANWR coast are eroding fairly significantly, but even there erosion rates are 0.9 meters less per year than the heavily eroding sites in the National Petroleum Reserve on the western North Slope, the report said. Conditions could accelerate erosion in the future, the report said: Sea ice continues to retreat and permafrost is warming at about the same rates as elsewhere on the North Slope. One species faring especially poorly in the ANWR coastal plain is muskoxen. The northeastern population peaked in 1995 at 700 animals but declined to 216 by 2006, and since then has virtually disappeared in the area between the Canning River — the ANWR boundary — and the Canadian border, the report said. The report blamed the decline on predation of muskox calves by brown bears, in combination with other factors like disease, poor nutrition and poor adult survival.